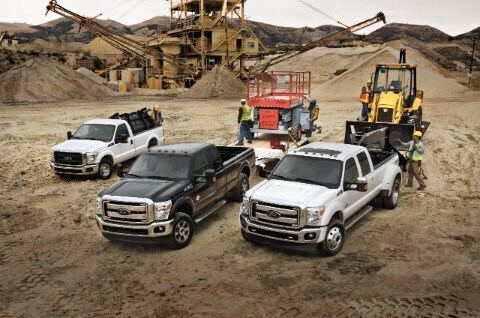 Take the bestselling vehicle in America and add capability and power and you get the wonderful F-350 Super Duty. It is built for heavy operating including towing and activities within a professional environment. This truck is a great work horse and thrives in this atmosphere. The ability to also take the work truck home with you as an everyday vehicle exist with the edition of modern luxuries coming at available higher trim levels. This truck comes in a wide variety of cab and bed configurations and can be had with either a diesel engine or a gasoline set up. There are a couple options for engines on this truck. The options are as follows: a 6.2-liter V-8 engine unleashing 385 horsepower and 405 lb.-ft. of torque or a 6.7-liter turbocharged V-8 getting a magnificent 440 horsepower and 860 lb.-ft. of torque. There is also one more step up for a great towing engine setup with the 6.7-liter Power Stroke Turbodiesel V-8. There are also many different electronic setups available such as the one the is used to operate a snowplow. The diesel engine also has the option of a "Jake Brake" which helps slow the engine down in certain operating situations. The Ford-built 6.7-liter Power Stroke V8 features a compacted graphite iron engine block. This material helps reduce weight and increase strength. An option package can make the gasoline engine capable of running on compressed natural gas (CNG) or liquefied petroleum (propane) gas (LPG), but does not include the fuel tanks or other equipment. The Super Duty cabin ranges from basic to luxurious. In the regular cab form the seating is limited to three people while crew and super cabs can have up to six people riding. Lower trim levels have basic vinyl seats while the upper level offer more luxury with premium leather. On the exterior regardless of what model you choose the vehicle makes a strong statement for its bold and rugged nature. It has a large front grille and large rear tailgate stamped with a sharp looking "Super Duty" on the bottom. These trucks have not switched to any aluminum components on their bodies and remain with many different configurations. The interior can be quite refined with the previously mentioned leather upholstery and steering wheel, ventilated seats and a heated steering wheel. Can you help me finance my 2016 Ford F-350 ? Safety onboard the F-350 is a plenty offering Advance Trac technology combined with Roll Stability control, MyKey programmable vehicle key, crash severity sensors, airbags and much more. There are also factory installed LED warning lights that come in handy for enhanced visibility while working on the job site. Coming standard on the Ford F-350 are anti-lock brakes traction and stability control, trailer sway control, hill start assist, side curtain airbags and an SOS post-crash system. 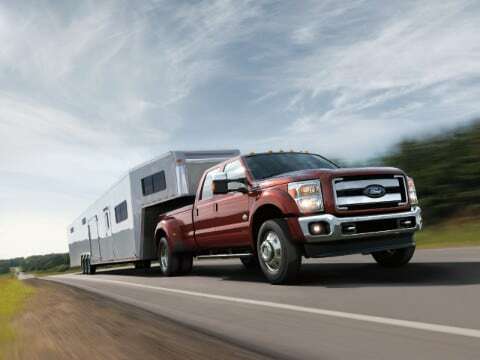 An integrated trailer brake controller is standard on XLT and higher models, while the Lariat trim level adds rear parking sensors and power-adjustable pedals. 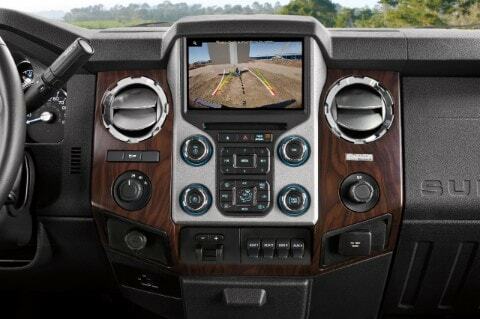 A rearview camera is optional on the XLT and standard on the Lariat and above. This is a great work truck and also has a cool ability to be your all around vehicle for weekends and some family driving.